Flashman chronicles the misadventures of a 19th-century cad who, through sheer luck and an uncanny ability to be in the wrong place at the right time, manages to emerge a national military hero in Britain. 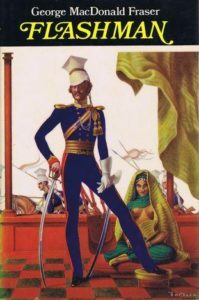 Imagine James Bond as a racist, misogynistic coward, and you’ll have the gist of this series (begun in 1969) about Harry Flashman, an unapologetic jerk in 1840s Afghanistan who deflowers dimwitted country girls, fornicates with superior officers’ wives and, when things go badly, as they invariably do, pins the blame on someone – anyone – else. Bottom line: Flashman is amusing, albeit forgettable, fluff.